I've noticed we have a few new modelers in our midst, but still not a lot of talented texture artists (in my opinion those two things must go hand in hand for success). I thought I would give some of our budding artists the chance to jump right in. 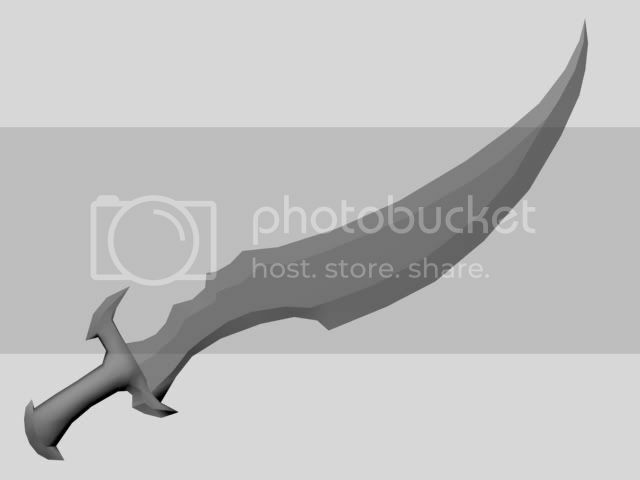 I modeled a sword tonight and I'd like to give you guys a chance to come up with a unique texture for it. Most of you know I'm fully capable of making my own textures, so I'm not just trying to trick you into doing my work for me. In fact I'm not releasing this sword anywhere but my own website (with just my own work attached), but I may allow some of you to release it wherever you like with your custom texture, so you might consider this a little competition. I also hope that some of you who consider yourself 'new' will participate and share your textures as they come along so we can help you make the most of your talent and your software; I'm hoping some people will take this on as a learning experience. You can find the UV map here and the PK3 here. Both a GLM and MD3 have been included for easy import into modeling software (or just use ModView if you like). Happy painting to those that decide to participate. I look forward to seeing some interesting designs. This is a texturing thread, not a photosourcing thread. Those was textures goofy, not photo sourcing, you whated a skins right and I made those textures. Welcome to Quoting 101: When someone quotes another person, they're not talking to you! EDIT: should i send u the .psd( photoshop files) so that u could see my every brush stroke? Post the texture map please. http://static3.filefront.com/images/personal/r/reelo2228/156004/mrqstrbdja.jpg good practise though, maybe like my fifth proper skin, thx for the comment. You might want to finish. There are a few surfaces you clearly missed.